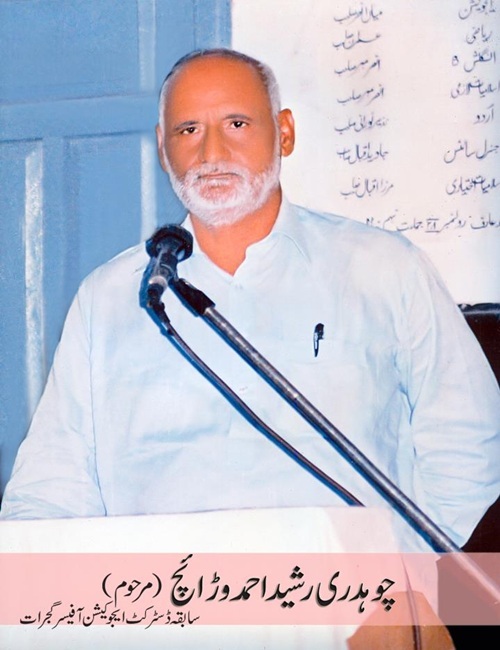 Chaudhary Rasheed Ahmed Warraich (DEO Elementary District Gujrat) was died on 20 September, 2010 at the age of 58 years in Mayo Hospital Lahore. He was suffering from Hepatitis-C from long time. Now after the failure of all the latest and comprehensive treatment facilities, his soul met to Almighty Allah. May Allah Rest His Soul in Heavens. Chaudhary Rasheed Ahmed Warraich was born on 1952 at Chooknanwali, a village of Gujrat near Kunjah. He was very kind to all; his family, his friends, his colleagues and all other relatives. He was a symbol of sympathy and simplicity. His life was full of struggle. He started his career as a private school teacher then he joined the Government Department of Education as a Teacher. He also served as Principal in many schools of District Gujrat. His students are very successful in all major fields of life and working in many departments of Pakistan on key posts and abroad also. His students also praised his gentleness to them in very good words and in commendable way. He joined the education department after PCS. He served as DEO (Secondary / Elementary) for many years. He also worked as EDO for some time. He served the nation with honesty. His Namaz-e-Jannaza was offered on the same day of Monday at 04:00 pm in the Janaza Gah of Chooknanwali and he was buried in the graveyard of Chooknanwali. Thousands of people gather from all corners of District Gujrat and Jhelum & Mandi Baha ud Din for his Nammaz e Jannaza. If anyone wants to say something about Chaudhary Rasheed Ahmed Warraich or want to pay tribute to Chaudhary Saab, he can write in the comments box below. Ch Rashid Ahmad was a great person, a loving father and a devoted educationalist. He lived his whole life with integrity. His life was full of struggle that's why even he started from zero he was a hero among his colleagues, family and of his field. The struggle of his life is a source of continuous inspiration to the young generation of District Gujrat. I feel blessed and i thank God Almighty that i can proudly claim that "i am son of Ch Rashid Ahmad". He was a source of great inspiration to me as-well, "He didn't tell me how to live; he lived, and let me watch him do it." I must say "Father, your guiding hand on my shoulder will remain with me forever". Thanks Umar Brother for leaving your valuable comment. He was also very kind to me. "aisaar ka haloos ka paikar thee us kee zaat khushbuayee sadgee sy muatar thee us ke zaat surat m ik husan to seerat main ik jamal aiena us ka roop tha johar thee us ke zaat tahzeebo aghee ky sabaq us ky nutaq main dill ky sadaktoon sy munawar thee us kee zaat kiss mun sy kahain ky wo hum main nahi raha kaisy kaheen hum ko muyasar thee us kee zaat soya wo zair-e-haq to ik ehad soo gyaa har rang kee bahaar ka manzar thee us kee zaat." " tumhary baad kahan wo waffa ky hangamy koi kahan sy tumhara jwab lay gaa" " apni hy wo misaal ky jaisy koi darakht auroon ko chaoon bakhsh ky khud dhhop main jally"